Our Vacation Bible School week is coming up June 5-9. 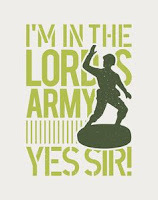 We're doing a military theme under the title "Call to Action," as Jesus said to stay dressed for action (Luke 12:35). We'll be going through Romans 12:9-21 with the kids and teaching them the marks of a true Christian. In addition to the Bible lessons, there will be crafts, games, snacks, skits, and music. Register by calling us at (785) 762-4404 or e-mail fsbcjc@gmail.com. Leave your name, number, and your child's name and age. Suggested donation is $5 per child which you can pay on the first day of VBS. We'll meet from 6:00 to 7:30 each evening. Jubilee Kinney is the VBS director.